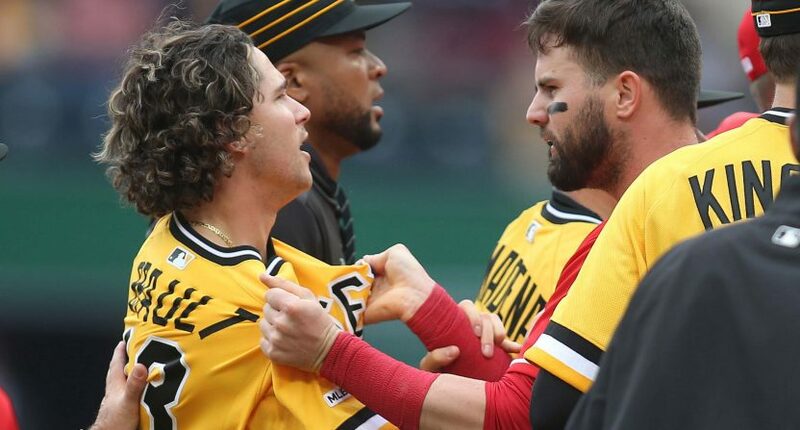 Early in today’s Reds-Pirates matchup in Pittsburgh, Reds infielder Derek Dietrich unloaded on a Chris Archer pitch, turning right around and launching it out of PNC Park and into the Allegheny River. Dietrich did obviously admire that one, but it’s important to note that it should be allowed! He just hit a ball into a river, and it’s tough to judge anyone too harshly for wanting to watch it as long as possible. Because the Pirates are the Pirates (and because they’re still managed by world class curmudgeon Clint Hurdle) things escalated the next time Dietrich came to the plate. That’s when Archer threw behind Dietrich, and then the benches cleared. The whole video is interesting, because after a few minutes it had all the hallmarks of a basebrawl that featured some very reluctant participants; four people holding back one person, players from both teams mingling and laughing. Then, Yasiel Puig heard something he didn’t like, and things heated back up very quickly. There were plenty of ejections all around, as you’d probably expect, including Puig. Not ejected: Pirates starter Chris Archer, the person most to blame for the entire incident. Good stuff, umpires! But, we do have to thank Archer a bit, because we got a knockdown brawl while one team was wearing throwback uniforms, and that’s about as much fun as you can have watching baseball on an April Sunday.